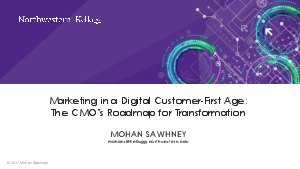 For Mohan Sawhney, Innovation and Marketing professor at the Kellogg School of Management, digital transformation is about customers. Mohan even goes one step further to say that customer’s expectations have changed. Companies are no longer just competing against their industry but against the best of the best - companies like Amazon, Netflix and Airbnb. For a more in-depth view into this new competitive landscape and Mohan’s insights into how to compete, please download this complimentary pdf and video of his presentation.